We all learned last week from the Census Bureau that the poverty rate rose to 15.1 percent in 2010. Amid the blizzard of statistics was this factoid: 20 percent of U.S. households live on less than $20,000 a year (cash income in 2010 dollars). Underlying this one-year snapshot is a complicated dynamic. Often, household incomes fluctuate week by week and month by month, especially among those in the lower income ranges. Given these gyrations, what’s likely to happen to the incomes of the 24+ million American households in this lowest quintile in the coming years? For starters, recent published Census data for the 2004 panel of the Survey of Income and Program Participation--a national sample tracked from 2004 through 2007-- justifies some optimism. In those pre-recession years, the economy was reasonably stable, with unemployment below 6 percent (compared to today’s 9+ percent) and the poverty rate was below 13 percent (compared to the just-announced 15+ percent). But even ignoring that we’re in harder times now, these numbers raise concerns. If we look at what happened to households in the bottom fifth during the three years tracked, it’s a mixed bag. More than two-thirds (69 percent) stay in the bottom quintile, divided roughly equally among those whose annual incomes drop by more than 10 percent, stay about the same, or rise by more than 10 percent. 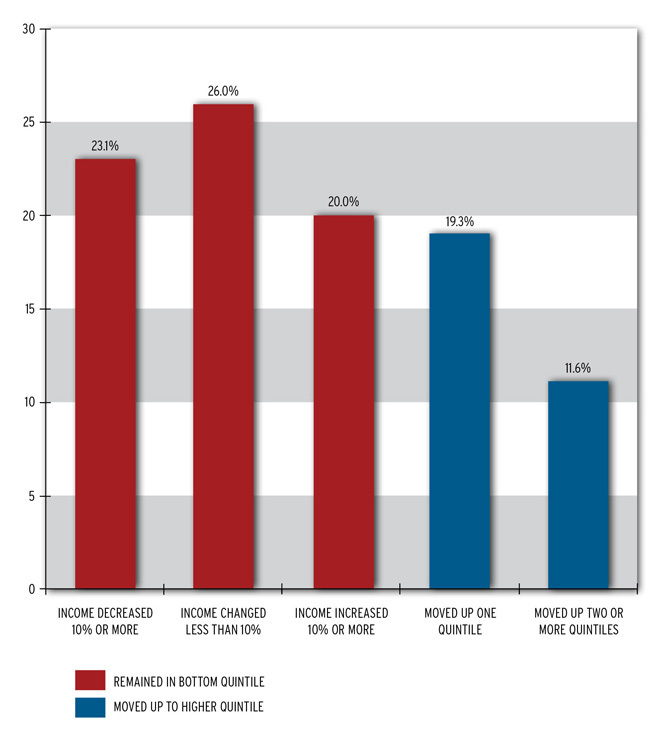 The good news—again, based on 2004-2007—is that 19 percent move up to the second income quintile, and—remarkably—12 percent move up by two or more quintiles. Based on this mid-decade experience, which low-income households enjoyed the greatest upward economic mobility? The educated, the married, the young, and non-Hispanic whites. The chances of advancing two or more quintiles within three years were appreciably higher for those with a bachelor’s degree: five times higher than for those who didn’t finish high school. Married people were twice as likely as the never married to jump two quintiles. And those 15 to 24 were twice as likely as those 45 to 64 to make the leap. Meanwhile, the odds for non-Hispanic whites were two-thirds higher than for blacks. Here’s the concern. Over the past decade, the demographic profile of those in the bottom fifth has changed in ways that dampen upward mobility. Relatively more householders in this group have never been married. More are 45 to 64. And more are black. Combined with the risk that the economy performs fitfully over the next several years, income growth isn’t likely to follow the normal pattern of recent economic recoveries. Remember that earlier factoid? By this time next year, we may learn that households at the 20th percentile of the income distribution have incomes of less than $20,000. We’re climbing out of a hole that’s deeper and steeper than before, and making progress against poverty is all the more difficult.